Now that the Olympics are well underway, you might have developed a few questions about the games' equipment. For example: How does one steer a bobsled? Let's take a crack at answering this pressing query. 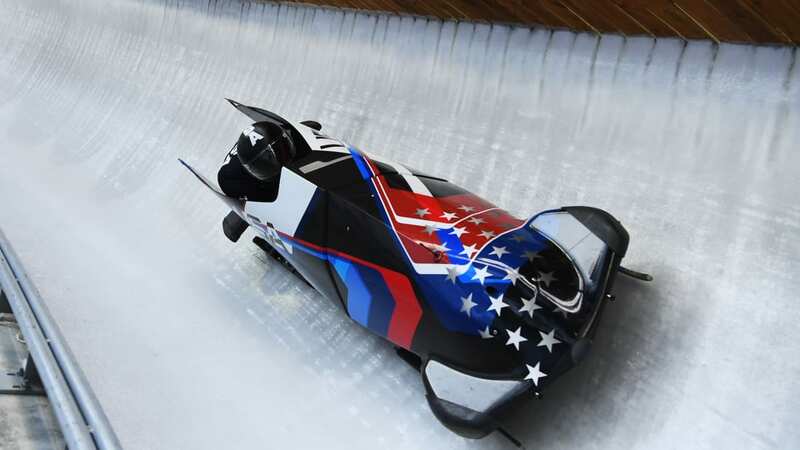 Bobsled teams careen down an icy, curving track at up to 90 miles per hour, so steering is no small concern. Drivers steer their sleds just like you steered your childhood sleds—by manipulating a pair of ropes connected to the sled's steel runners. The driver also gets help from the rest of the crew members, who shift their weight to aid with the steering. Why do speed skaters wear glasses? Speed skaters can fly around the ice at upwards of 40 mph, so those sunglasses-type specs they wear aren't merely ornamental. At such high speeds, it's not very pleasant to have wind blowing in your eyes; it's particularly nightmarish if the breeze is drying out your contact lenses. On top of that, there's all sorts of ice and debris flying around on a speed skating track that could send you on a fast trip to the ophthalmologist. Some skaters also say the glasses help them see the track. American skater Ryan Bedford recently told the Saginaw News that his tinted shades help him focus on the track and filter out distracting lights and camera flashes from the crowd. What kind of heat are the biathletes packing? 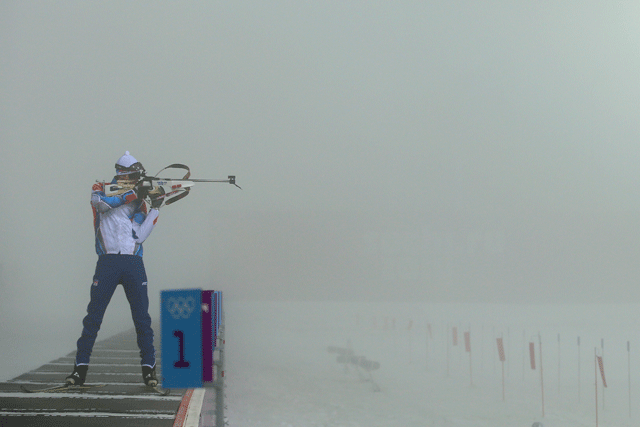 As you might guess, there are fairly strict rules governing what sort of rifles biathletes carry on the course. They are equipped with guns chambered for .22 LR ammunition. The gun must weigh at least 3.5 kilograms without its magazines and ammunition, and the rifle has to have a bolt action or a straight-pull bolt rather than firing automatically or semi-automatically. Is a curling stone really made of stone? You bet it is, and it's not just any old stone, either. Curling enthusiasts swear by a very specific type of granite called ailsite that is only found on the Scottish island of Ailsa Craig. Ailsite supposedly absorbs less water than other types of stone, so they last longer than their competitors. Ailsa Craig is now a wildlife sanctuary, so no new ailsite has been quarried since 2002. 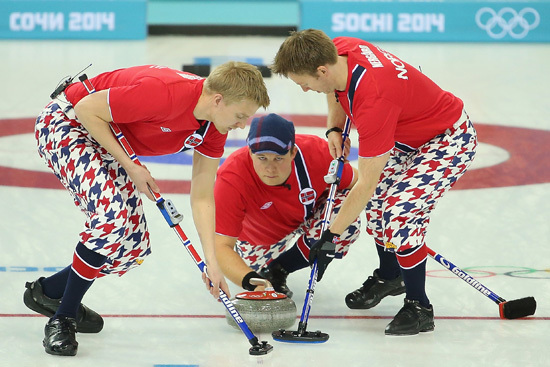 As a result, curling stones are incredibly expensive. Kays of Scotland, which has made the stones for every Olympics in which curling has been an official event, gets prices upwards of $1,500 per stone. The earliest curling brooms were actual brooms made of wood with straw heads. Modern brooms, though, are a bit more technologically advanced. The handles are usually made of carbon fiber, and the heads can be made of synthetic materials or natural hair from horses or hogs. 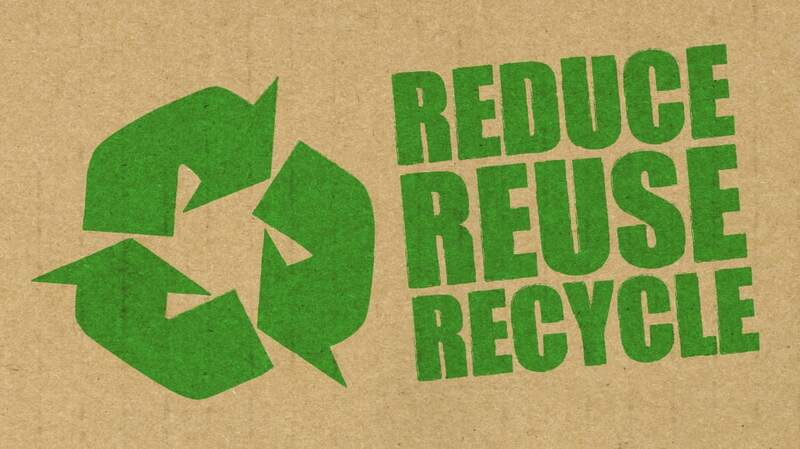 Synthetic materials tend to be more common now because they pull all of the debris off of the ice and don't drop the occasional stray bristle like a natural hair broom might. 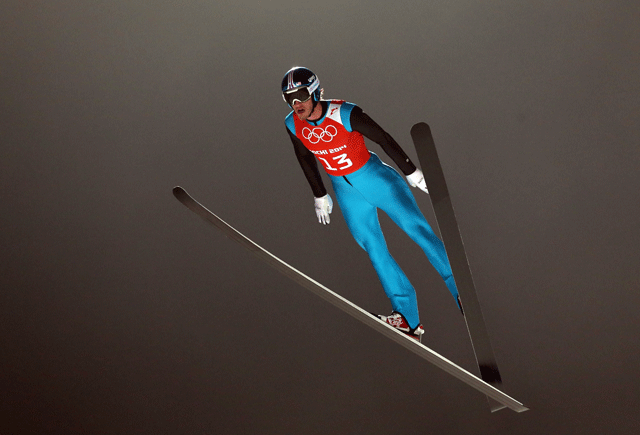 What are the ski jumpers wearing? It may look like a ski jumper can pull on any old form-fitting bodysuit and hit the mountain, but things are a bit more complicated than that. Their suits have to be made of a spongy material and can't be thicker than five millimeters. Additionally, the suits must allow a certain amount of air to pass through them; jumpers wearing suits without sufficient air permeability are disqualified. (This rule keeps jumpers from wearing suits that could unfairly act as airfoils.) These rules are seriously enforced, too; Norwegian skier Sigurd Petterson found himself DQed at the 2006 Torino Games due to improper air permeability. Those aren't the only concerns, though. In 2010, judges disqualified Italian jumper Roberto Dellasega because his suit was too baggy. What's up with the short track speed skaters' gloves? If you watch a bit of short track speed skating, the need for gloves quickly becomes apparent. When the skaters go to make passes or careen around a turn, they need the gloves to keep from cutting their hands due to incidental contact with other skaters' blades. There's more to the gloves than just safety, though. Since the skaters' hands often touch the ice during turns, they need hard fingertip coverings that won't add friction and slow them down. The tips can be made of any material as long as it's hard and smooth, but you've got to give American skater Apolo Ohno some style points for the gold-tipped left glove he broke out in 2010.